Went on a magic trip this weekend. Sheila put a trip together led by a friend of hers Don Leitch, ex-Melmoth farmer and great birder. The first part was to Melmoth itself (or more accurately nearby Ntonjoneni to friends and fellow farmers Gavon and Sandy Calverley). We traveled with another of Skiboat’s many friends, Simon Dunning (ex-SADF helicopter pilot, then a commercial airlines pilot). 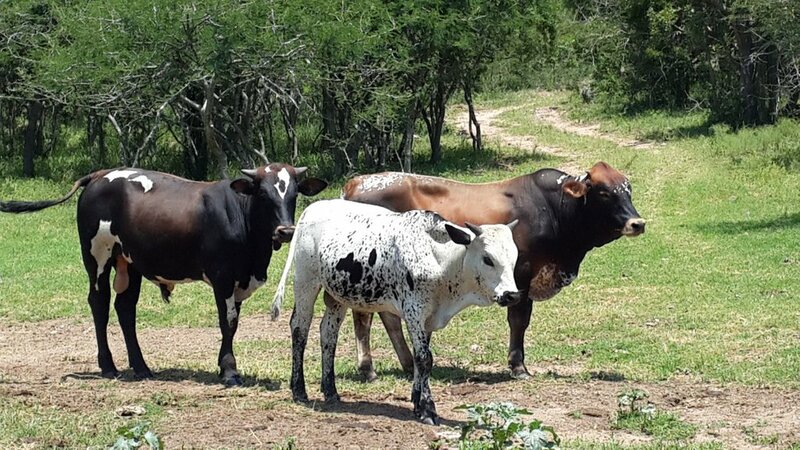 Gavon & Sandy farm black wattle for its tannin and Nguni cattle for their marbled meat with its yellow fat (“It’s good for you! It’s grass-fed. White fat means it’s grain-fed”) and have game-fenced 1000ha of their land in the Emakhosini valley – The Valley of the Kings – together with their neighbours into a beautiful reserve where they run giraffe, buff, wildebeasts, nyala, impala etc with their multi-coloured Ngunis (which I was surprised to hear they round up daily to count and weekly to dip). Next door, Amafa (the official KZN heritage outfit) have bought farms – 12 at last count – and fenced them off to preserve them. We saw lots of game on that land. Also nearby is the 24 000ha Opathe reserve. Gavon, Sandy, Don and Sally (Melmoth local) have been doing a twice-yearly bird-count in their area for the last 17yrs for UCT’s bird fellas. This one’s called CAR for “co-ordinated avifaunal roadcount” – you drive and check for birds, stopping every 2km to scan. Same route on the same day every time. The last weekend in January and the last weekend in July. We joined them for this one. Gavon had a new toy: An old white Landcruiser bakkie he has rigged out as an open game-viewing brake. The seven of us set out early morning with enough food and drink to have supplied the whole impi that moved through here en route to bliksem-ing the redcoat Poms at Isandlwana in 1879. What a lovely day. Birding at its best, crisp weather, cool at first on the high hills till the mist burned off as we descended the valley. The count has been dropping over the 17 years. They told us how they used to see plenty storks (we saw none), herons (none), cranes (we saw four blue cranes), secretary birds (one) and raptors (jackal & steppe buzzards, tawny, longcrested, martial & wahlberg’s eagles, vultures, lanner & amur falcons). Gavon (60) and Don (70) are old Melmoth farming buddies so the quips and insults flew thick and fast. Plenty of puns and lots of unhelpful advice, criticism and suggestions. (Eg: – When Don was earnestly pointing out a willow warbler in a fever tree, Sandy leaned over and tried to straighten the crooked end of his finger. – Don’s croc-like sandals squeaked as he walked, bringing the quip “Hark! What’s that sound! I think it’s a step buzzard”!). Sunday we went to Dlinza and Ngoye forests.